Both sides are gearing up for battle over plans for a new building at 5775 Collins Avenue in Miami Beach's Mid-Beach area. Neighbors have dubbed it “Godzilla” and are protesting reduced view corridors and the lack of beach access in the developer’s proposal. They’ve hired an attorney to represent them before the DRB, an unusual action for residents to take. 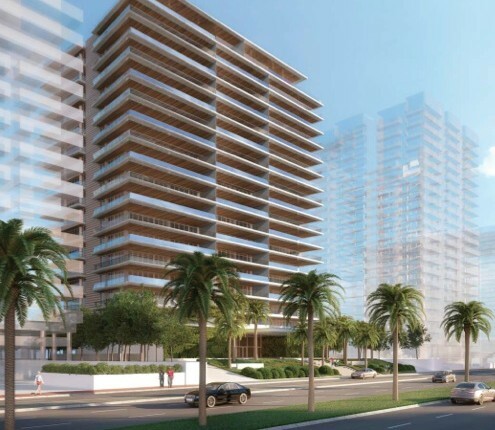 In an emailed statement, the owner’s attorney, Michael Larkin, said the design “maximize[es] compatibility for the greatest number of affected stakeholders” and “conforms to all City of Miami Beach requirements”. In preparation for its presentation, the developer – Multiplan – has hired a PR firm. Multiplan also built the Il Villaggio Condominium on Ocean Drive in Lummus Park. Residents don’t disagree with the developer’s right to build as proposed, rather they are supporting a City Planning Staff recommendation to “reorient” the building perpendicular to Collins Avenue versus the currently proposed parallel orientation. This, they say, would preserve view corridors and allow ocean breezes to continue flowing. The current Marlborough House has stood on the site for 55 years with generous side setbacks. In its report to the DRB, Planning Staff says the proposed building "will effectively broadside the Ocean, reinforcing the ‘Condo Canyon’ effect notably seen along portions of Collins Avenue by building the tower from side setback line to side setback line.” The proposal, they note, “will diminish both side yards that serve as important view corridors by over half." Both sides are expected to turn out supporters at next week’s meeting. The item will be heard first due to the anticipated level of interest and attendance. Full details on the proposal and staff recommendation here. Attend in person to make comments or send an email to James Murphy with your thoughts.